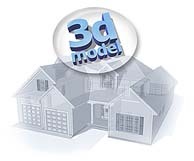 View and rotate virtual 3d exterior models of these new home designs shown below. Click on a picture, then click the "View 3D Exterior Model" button on the plan's descriptive page. Adobe Reader 7.0 (or later) is required to view the models.